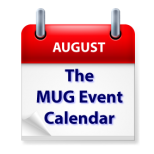 An appearance by Jamie Siminoff of Ring at a California group highlights this week’s MUG Event Calendar. Automating the Mac will be discussed at a Texas group, a film festival will take place at a California group, and a Michigan group will celebrate 30 years. Other topics for the week include picnics and BBQs, future technologies, Disk Warrior, macOS Sierra, art adventures, and more. Saturday 20-Aug Annapolis Apple Slice – Meet, Greet, Show, Demo, Help. A social workshop.